“Breaking news on shuttling Mon 18th June – Despite publicly stating that the Old Warburton trails are ride in, ride out and that the Powelltown trails would cater for riders who prefer to shuttle, Yarra Ranges Council (Jason Kelly) today confirmed that Shuttle buses would run from Warburton to the top of Mt Tugwell trailhead if their plan goes ahead. They gave no explanation as to how they would prevent people in private cars/ vehicles doing the same.”, OWRA. Yarra Ranges Council now say they’ve solved shuttling problems by simply marking some trails on the map as “ascending”. They call it a “ride in, ride out experience”. We are asked to believe that everyone who wants to ride down these tracks will first spend a couple of hours pedaling to the top of Mt Tugwell. What nonsense. If they have abandoned their plans for shuttle buses this means there will be even more private cars tearing up and down our road if this project plan for Old Warburton goes ahead. Other than Mt Tugwell, the point that tourists would shuttle to is a place on Old Warburton Rd near the old cemetery where 5 proposed trails meet. The reality is that we live on public roads and there is nothing the council could do to stop people using them to access these trails. If this trail network is built in Old Warburton, residents amenity and safety will be forever compromised by heavy tourist traffic. 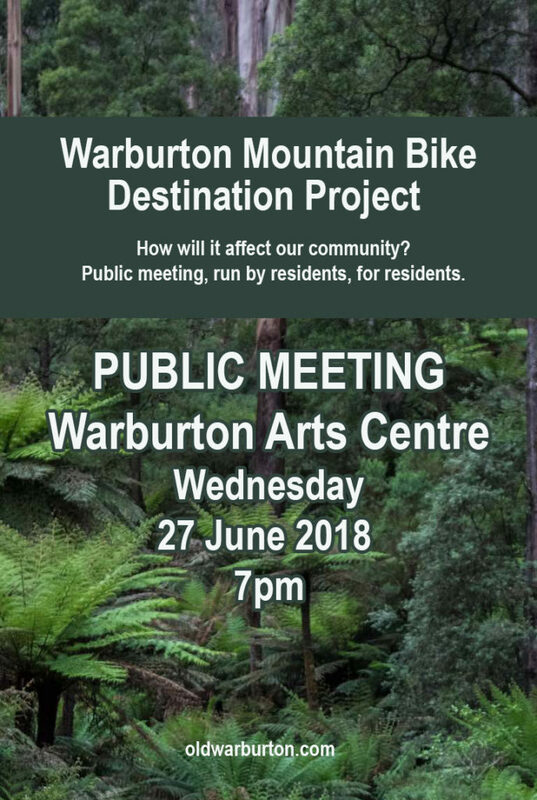 That is the main reason DELWP have previously closed illegally built trails in the Old Warburton area.